Gravity Energy Storage: Integrated with StratoSolar PV generation. The combination provides a continuous supply of dispatch-able electricity. The combination is a complete replacement for fossil fuel power plants with no need for backup, storage or additional transmission and distribution. 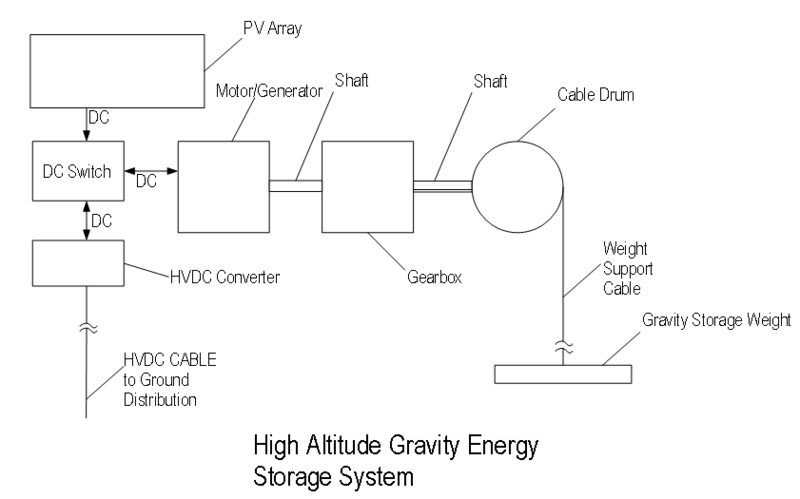 Examples of gravity energy storage. Energy is used to raise a mass through a height thus storing energy as gravitational potential energy. The amount of energy stored is mass times gravitational acceleration times height raised. The most common large scale use of gravity energy storage in current use is pumped hydro storage, shown in the diagram on the left. Electricity powers a pump that raises water from a low reservoir to a high reservoir thus storing energy as gravitational potential energy. Subsequently energy is recovered as water flows down and drives a water turbine which drives a generator producing electricity. This approach moves a large mass (hundreds of thousands of tonnes) through a small height (hundreds of meters). 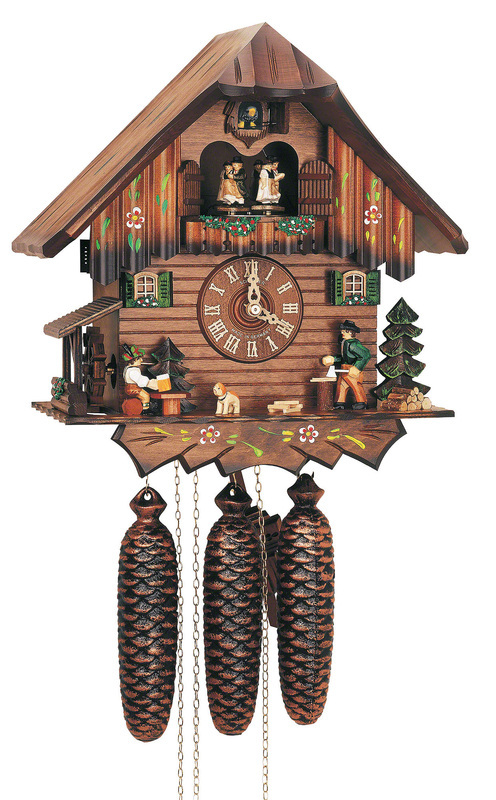 Cuckoo clocks as shown above demonstrate another simple gravity energy storage mechanism. Human mechanical energy raises weights to store energy to power the clock. As the weights fall under the control of the escapement mechanism, the energy is recovered to drive the clock mechanism. 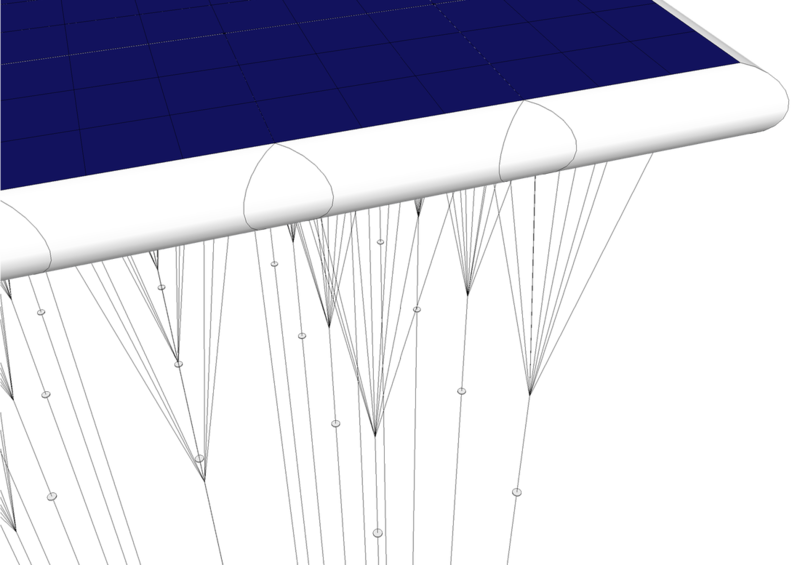 StratoSolar gravity energy storage stores energy by raising relatively small masses (hundreds of tonnes) from the ground to the buoyant platforms at 20,000 meters using electric motor/generator driven winches. Very little environmental impact due to small weights. Pumped storage and other large mass-small height, energy storage systems use over one hundred times the mass of water or rock and associated ground area. This shows some close up views of the weights used to implement gravity energy storage. The weights are the small disks below the platforms on the tethers. 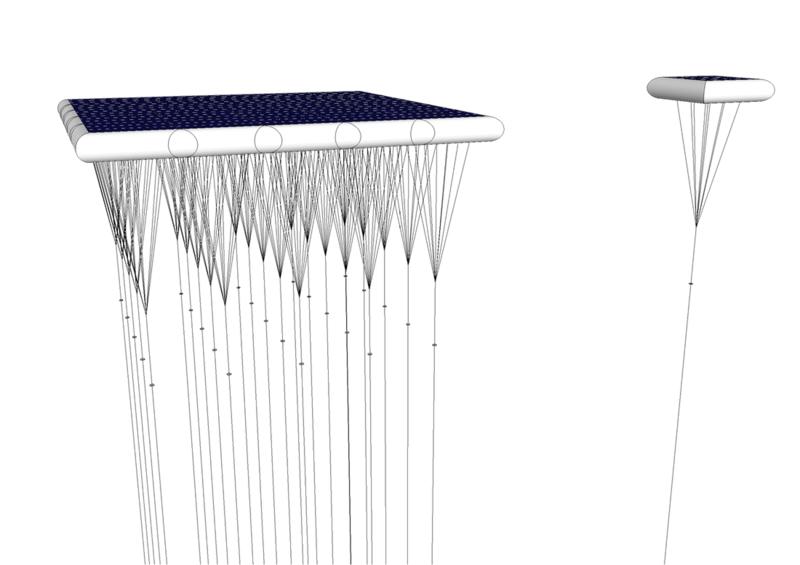 This shows the small size and modular nature of the energy storage that matches the modular platform PV generation. Each kilogram of weight stores approximately 54Wh of energy when raised from ground level to 20km altitude. Each 500 tonnes of weight therefore stores about 25 MWh. The winches that raise and lower the weights are not visible in the drawings. They are suspended beneath the platform modules at the point where the support cables join to evenly distribute the mechanical load. The energy storage system is very simple, highly reliable, does not degrade with use, will last at least thirty years and has a high round trip efficiency of at least 85%. It is an integral part of the platform and as such has no geographic constraints. Storage scales naturally with PV electricity generation in units of about 25 MWh. The initial capital cost is about $125/kWh, which is better than any available or planned energy storage technology, and it will reduce in cost with volume production. 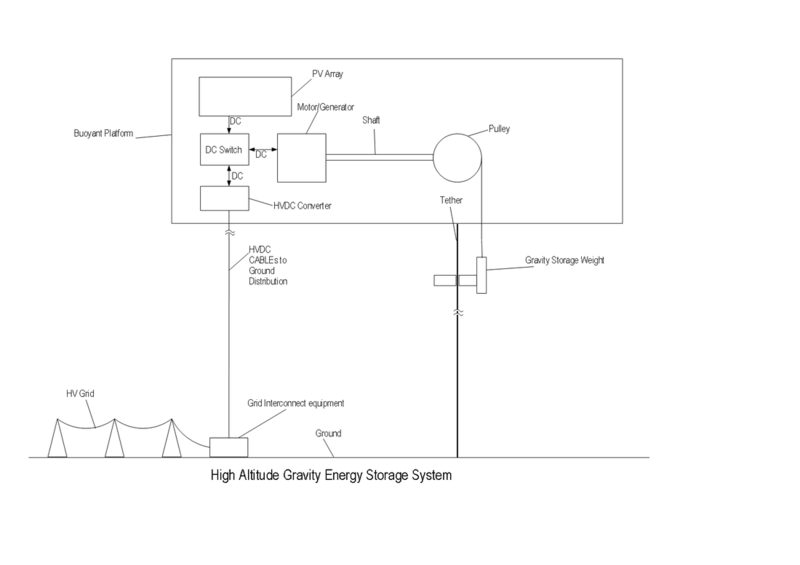 The block diagrams above show the connectivity of the elements of a StratoSolar Gravity energy storage system. These elements are supported by the buoyant platform and its tether, shown in the second block diagram. The HVDC cable is mechanically supported by the tether, or tethers for adjacent platforms, which is not shown in the diagram for simplicity. The motor generator and gearbox are a similar size to generators currently used in wind power. Like them there are two options, direct drive and gearbox reduction. The diagrams show both options. Direct drive is favored for 5MW and above. The cable drum stores the 20 km long cable that is attached to the gravity storage weight.The combination of the motor generator, the gearbox and the cable drum are commonly referred to as a winch. The HVDC Converter block acts as a bi-directional DC to HVDC converter. The DC switch block directs power from the PV array to the HVDC converter and a power controller for the motor/generator. DC power from the PV array can directly drive the motor generator to raise the weight and store energy. DC power from the PV array can also be converted directly to HVDC for transmission down the HVDC cable to ground level grid interconnect equipment. The motor/generator can generate DC power by lowering the weight thereby recovering the stored gravity energy. This is converted to HVDC for transmission down the HVDC cable. The round trip efficiency of storage is high with over 95% conversion efficiency of the winch in each direction. By making the HVDC converter bi-directional it is also possible to store energy from the grid delivered up the HVDC cable. This power is converted to DC and drives the motor/generator to raise the weight and store gravity energy.